Habbo Palooza is both a campaign and a range of furniture. First released in 2013, the campaign annually takes place in the summer and revolves around the theme of a music festival. Various games and activities are put together and includes Celebrity visits that are hired to appear in-game. In 2013 the events were created by a team of hand-picked users after submitting their event ideas, whereas in 2013 the Builders at Work team were in charge of the events. 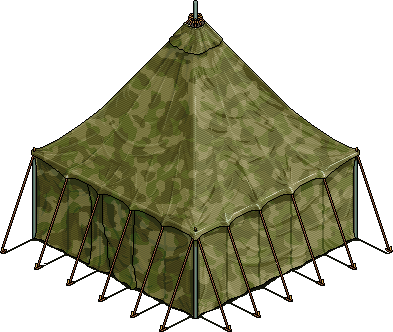 Tents were released on the 27th June 2013, and brought a new form of secrecy to players. 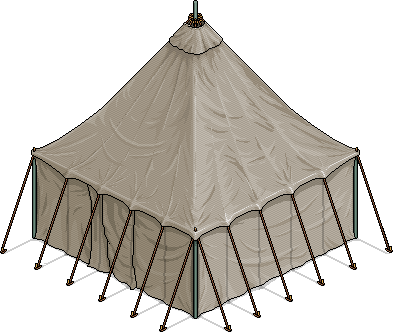 The Tents meant that players could go in one and no one outside would be able to hear what they were saying, if more than one player was in the tent then only they could hear. However, if users were in a tent they could still hear outside. Tents brought a redundancy to the whisper feature somewhat as if a player had a tent it was unneeded. There were 2 sizes of tents available as well as 4 colours which were blue, beige, orange and camouflage. The prices differed with the smaller ones costing 10 Credits each in the Catalogue whereas the bigger ones cost 20 Credits. As well as the Tents, other furni related to camping and summer were also released which included tables, chairs and a barbecue. Overall, it originally included 11 new items as well as an older one, this being the Grass Patch. On the 19th July 2013, a set of Palooza Guitars were made attainable via two different pinatas, with the five Guitars obtainable via the Ultra Rare Pinata priced at 120 Credits being worth more than those from the Rainbow Pinata priced at 25 Credits. Users needed to purchase an Effect from the Catalogue for 100 Duckets and walk under the Pinatas in order to break them and spawn a Guitar at random; with some Guitars being slightly more/less common than others. In addition, the 80s Rare Guitar was sold for 120 Credits as a monthly rare instead of being made available via pinatas. Palooza Rares were items of furniture released during the Habbo Palooza campaign which ran throughout the summer months, the category included 3 similar items in forms of stands for festivals. They were released for 8 hours each time and they became available on the 15th, 17th and 19th July 2013. They were all sold for 25 Credits each time. In accordance with the Habbo Palooza campaign, one LTD Edition Rare was released to celebrate this event. All 180 units were purchased. The Village Fair Bundle was released in July 2017 and included mostly Palooza furniture. A competition was held asking users to send in event ideas. The best ones were given the ability to help make the rooms for the event and host the events. The winners were also given Event Planner badges for their contribution. Another competition was held asking users to design their own stage room for the band Room 94 that was making an appearance for the campaign. The best room would have the event hosted in their room. Two lucky players were chosen to attend a live hangout with the Backstreet Boys, although the competition was only available for those who live in London. This competition asked users to submit a video showing themselves, or someone they know, performing an original, catchy song that contained no vulgar language. The winner had their video broadcasted in the Main Stage room, allowing thousands of users to listen to it. The overall winner was: DJay of Habbo.COM with his band Lazarus. The original winner of the music submission competition was Risoliogh of Habbo.fr, but it was seen by the judges that his music included too many samples of other songs in it, deeming it more of a cover than an original song and resulted in the song being disqualified. Sara and Tegan made an appearance on Habbo.com and Habbo.com.br and answered questions in the Main Stage room. This page was last edited on 11 February 2019, at 07:38.